snow | I think in comics. Finding Nemo? Nemo found us. 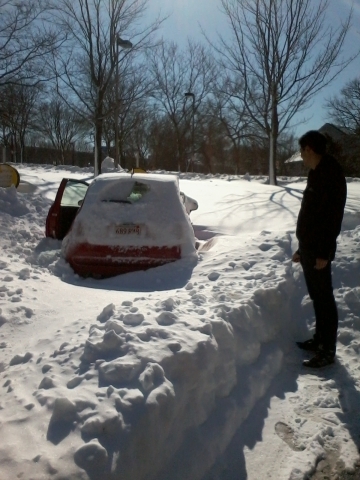 Shortly after, I dug out a car with a frying pan. Last weekend, Boston was hit by a historic snow storm. Starting Friday afternoon, Winter Storm Nemo dumped 24.9 inches of snow on the city. That is (according to Wikipedia) the fifth-highest amount of snow Boston has had… ever. All of New England was in a state of emergency. My workplace, for the first time in years, decided to shut down on Friday. Northeastern closed as well. The whole city braced itself for the storm. As did I. Since I didn’t want to be snowed in my suburban house alone, I decided to beat the snow and go to Northeastern Thursday night. That way, I could stick out the storm with my friends! I use the subway to get to Northeastern, and it was closing down on Friday afternoon. 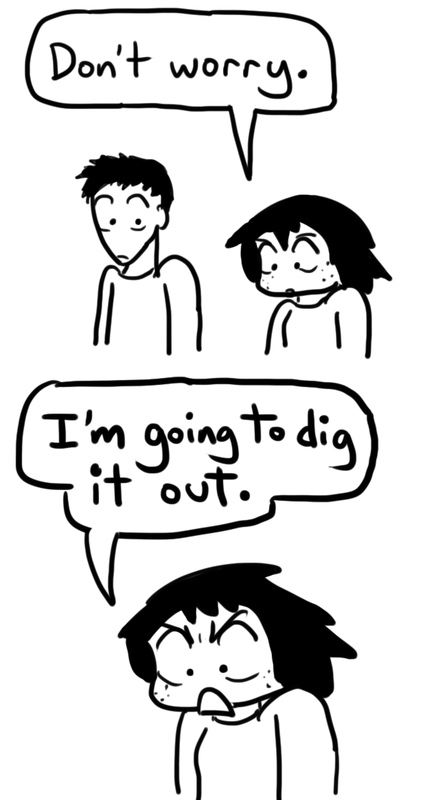 But that was okay, too. 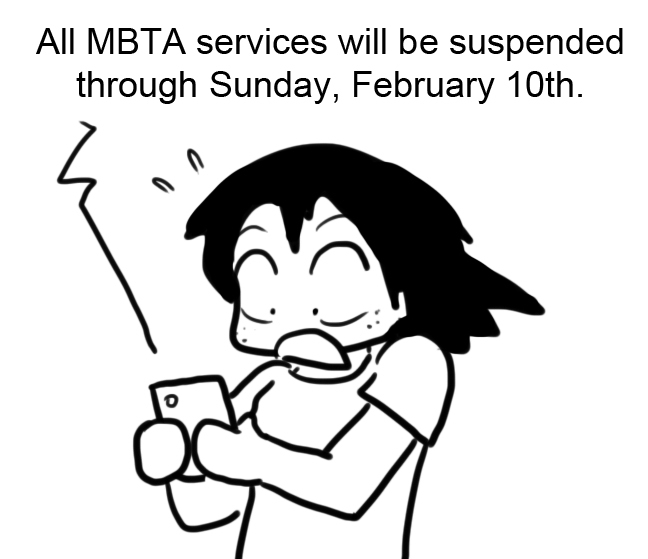 Because the T would be back by Sunday, right? I would be able to get back home, right? I was stranded. I had work the next day. To get to work, I needed my car. My car was back in the suburbs. I had to get home! I wasn’t going to be stuck in Boston! There had to be a way. I realized that, though the T was closed, the roads were not. I’m a member of Hertz on Demand, an hourly rent-a-car service that has cars stationed around Northeastern. If I could only rent a car and nab a friend, I could drive home and have my friend return the car. It could work. 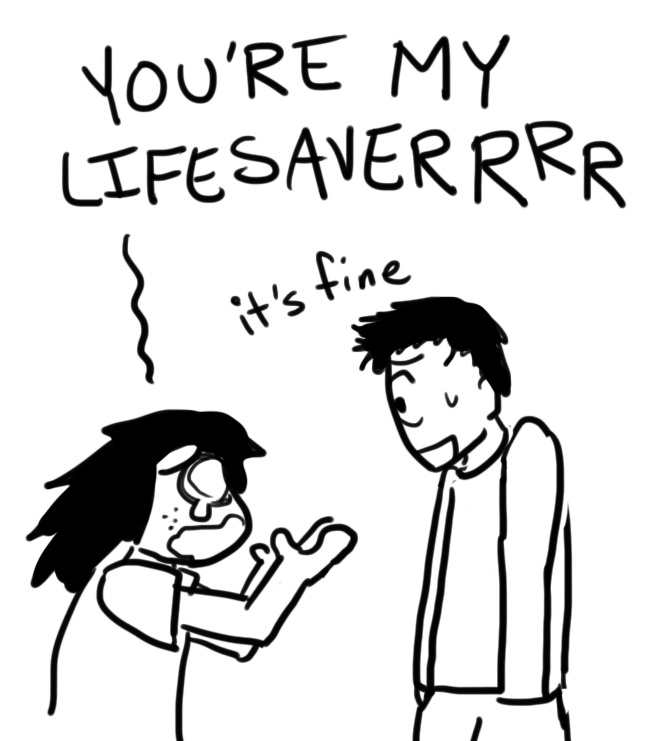 I’m lucky enough to have awesome friends, especially the super-awesome friend who offered to drive me. Not all cars are created equal, and Hertz knows it. Therefore, different car models rent for different prices. As a poor college student, I rented the cheapest car– a Fiat 500. It’s a petite car. Trying to drive it on the highway is a harrowing experience. It’s also front-wheel drive only. Therefore, it rents out for a little over $5 an hour. We were snowed in. We were more than snowed in. Like, we needed a snowplow to get us out of this. My friend and I failed to wave down a snowplow. But, maybe we could drive our way out of the snowdrift? So, I had a couple of options at this point. I could have called a cab and had a very expensive taxi ride. I could have waited to see if the T would eventually open. I could have simply accepted defeat, and called in work late the next day. Why did I decide this? I have no idea. I started trying to plow the snow out of the way. We called in some help. 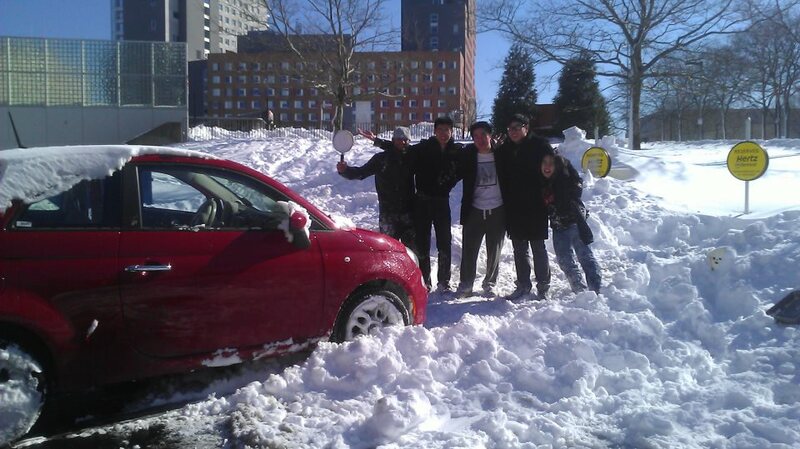 …and we proceeded to try to dig out the car with frying pans. That’s right. I used the same image twice. 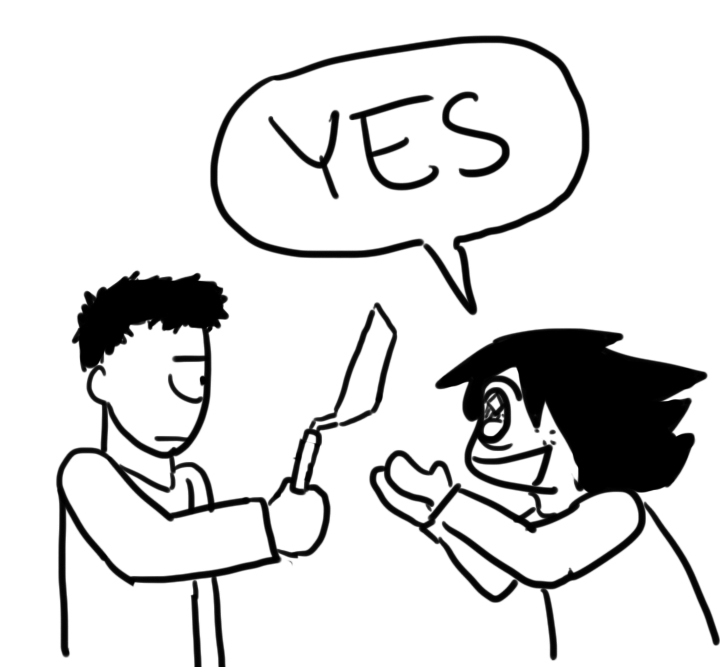 …Nobody said I was a great cartoonist. My friend captured our sad, sad moment of victory. Also, the guy all the way on the left IS holding a frying pan. The power of teamwork cannot be underestimated. Thanks to the help of my friends, I could finally go home! So now I’m down ten bucks and owe four hungry dudes lunch.